Kotpad Handloom Fabrics - Tribal weavers of the Mirgan community weave this vegetable-dyed fabric in the Kotpad village of Koraput district. 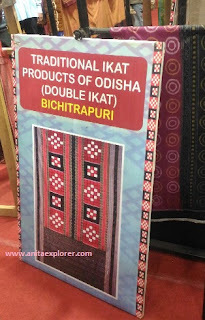 Kotpad was the first product from Odisha that received the GI. 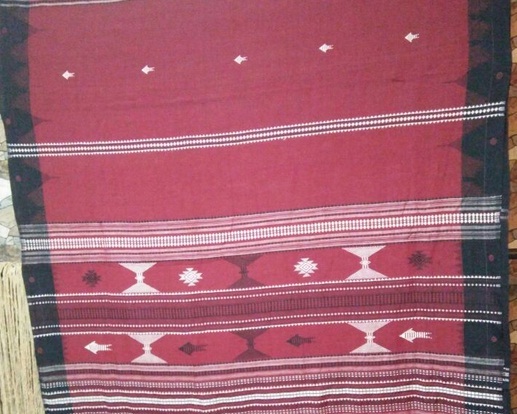 Khandua - Khandua is a type of Ikat saree. A special Khandua cloth with verses from 'Gita Gobinda' is worn by Lord Jagannath. 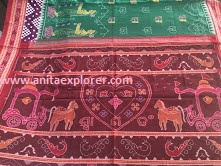 Sambalpuri Saree - Bichitrapuri, Sachipar etc are some sought-after Sambalpuri designs. The warp and the weft are tie-dyed in this traditional handwoven Ikat saree. Bomkai Saree - First originating in the Ganjam district of Odisha, Bomkai sarees are now woven at Sonepur. 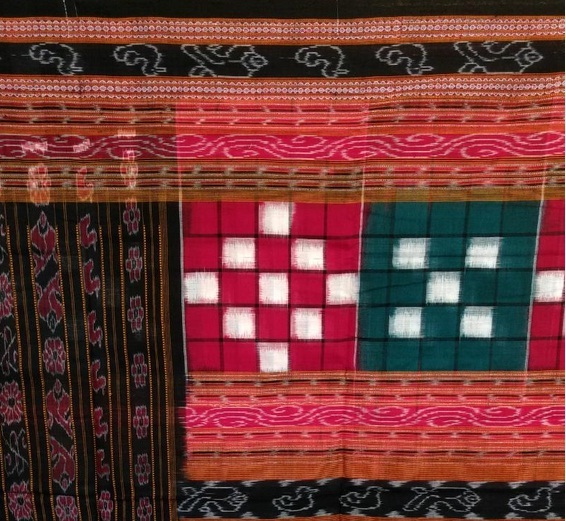 The weaving patterns and designs of Bomkai sarees are unique. 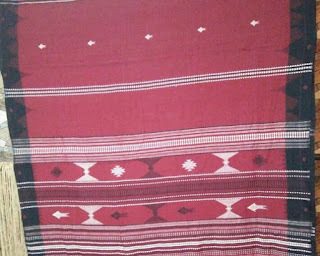 Berhampur Pata (Phoda Kumbha) Saree & Joda - Brahmapur i.e. Berhampur is called the 'Silk City' of India for its famous silk sarees with distinctive zari work border design. These sarees are draped to the deities- Balabhadra, Subhadra and Jagannath at Shree Jagannath Temple, Puri. 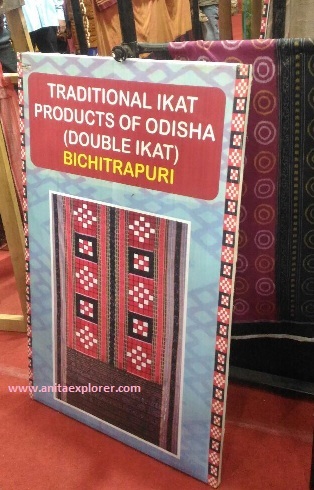 Orissa Ikat - Odisha's 'Bandha' or 'Ikat' is made through a special tie and dye technique of the warp and weft threads. Before weaving, the design is created on the loom. Its unique design makes this Ikat distinctive and special. 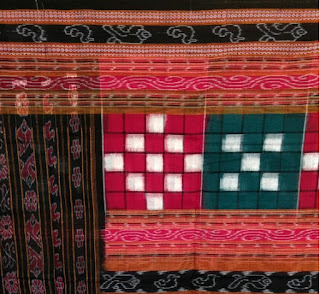 The weavers weave many designs including text in various languages especially Odia. Dhalapathara Parda & Fabrics - These are hand-spun using naturally-coloured thread in a village named Dhalapathara in Khurda district. Gopalpur Tussar Fabrics - Gopalpur Tussar and Gheecha threads are woven into fabrics with a 'cut shuttle' technique forming 'foda kumbha' pattern in the weft direction. Habaspuri Saree & Fabrics - The weaving, production and design is unique with its traditional patterns. Post for my second #atozchallenge. H for Handlooms. Odisha India Handlooms are loved all over the world! Heard of Orissa. Didn't know they are one and the same. The nearest Hank had been was decades ago on a train ride from Culcutta through Nagpur to Bombay. It was such a memorable experience. The handlooms are fantastic. Thanks for sharing Dr Anita! Oh how gorgeous! Really - Orissa handlooms are quite near the top of my favourite. But then I actually love all handloom. What a delightful theme. Sorry, I just discovered it. I really admire how you are doing so much for making people aware of Odisha's beauty and heritage Anita. A friend of mine, also from Odisha, has started an online venture, selling tribal handicrafts from her state. I see the same pride in her too. Thank you for visiting A2Z iPad Art Sketch 'Heart Hands'. I'm trying to catch up this morning after being away from Blogosphere to tend to some appointments. It was excellent to meet you. Is handlooming used to create rugs? These patterns you shared make me think of some large area rugs I've seen on display in stores in the states. I admit I'm ignorant on these things and I humbly apology now but the art is intricate and beautiful. I'm sure the artists and those who enjoy it most are fascinated with the handiwork of those skilled in producing such quality. Happy A2Zing! Though the content of this post would interest the distaff side of readers, i am amazed by the wide ranging variety of their handloom products.i will fwd the link to my daughters. Thanks. So beautiful. Thanks for the informative post on handlooms of Odisha.